Colombia, Slovenia, Spain, Puerto Rico, France, Switzerland, Turkey. Colectivo Cambalache, inhabitants of the neighbourhood. In the district of El Cartucho, an impoverished area in the city of BogotÃ , a group of students of the University of Los Andes, organised themselves in the "Colectivo Cambalache". This group aims to create an economy of sharing and recycling, using recyclersâ€™ filled carts. These recyclers, takes donations and redistributes them. 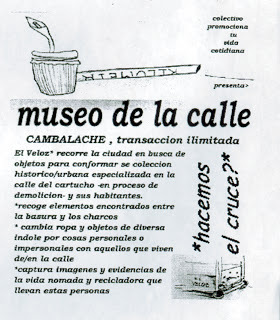 The project â€œMuseo de la Calleâ€, wants to to create n alternative economy through the donation, exchange and distribution of goods. Anyone who wants to take something from the cart can do it, as long as they also donate an object to the cart.